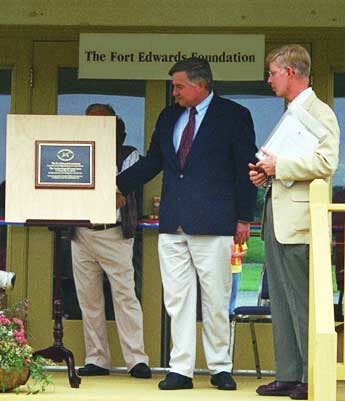 As its contribution to Hampshire Heritage Days 2000 The Fort Edwards Foundation set the date for the dedication of the new Visitor Center for Saturday, September 9th. About one hundred people gathered under a clearing sky in Capon Bridge, West Virginia, Saturday morning for the long awaited dedication of the Fort Edwards Visitor Center. 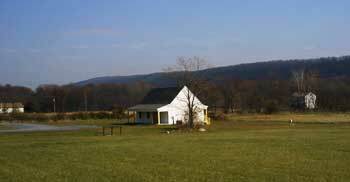 Since its founding in November, 1995, the members of the Foundation have looked forward to the day when they could open a facility to serve as an interpretative center for the important French and Indian War site on Joseph Edwards's land grant along the banks of the Cacapon River. The new building, although it will not be available for regular tours until next year, was opened to the public for the first time and remained open for the entire day. During the dedication ceremony, the Foundation gave honorary lifetime memberships to the four members of the Whitacre family of Capon Bridge who made it possible for the Foundation to purchase the land that the Center stands on. The Foundation was most concerned that the original site of the fort be preserved for future archaeological investigation. Placing the Visitor Center on the adjacent lot would protect the integrity of the historic site and allow space for interpretative and reenactment activities. 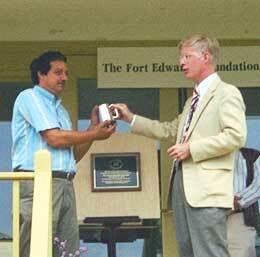 Also honored was the Archaeology Conservancy of Albuquerque, New Mexico, which had assisted the project to preserve the fort site by purchasing the property on the open market and holding title to it until The Fort Edwards Foundation could be formed and could raise the money to take title to the land. The Conservancy is a national organization headquartered in Albuquerque, NM that secures and preserves important archaeological sites. A plaque has been installed in the Center as a permanent reminder of the Conservancy's role in this preservation project. 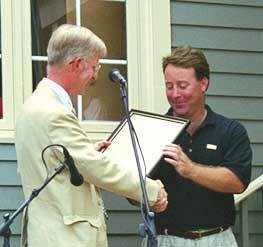 Mr. Paul Gardner, the regional director of the Conservancy for our area was on hand to unviel the plaque. As a special honor for the two individuals who were instrumental in initiating and securing funding for the project, the Foundation commissioned Delegate Jerry Mezzatesta and Dave Pancake as a "Colonel of the Virginia Regiment". This mark of distinction is a very extraordinary honor with strict criteria for individuals who make a significant and unique contribution to the work of the Foundation. In this particular case, the individuals have not only significantly helped our project, but they have made noteworthy contributions to other historic project in Hampshire County. We are proud to be the first organization to make such a unique note of their contributions to historic preservation in our County. A highlight of the ceremony was the music performed by two very different groups. 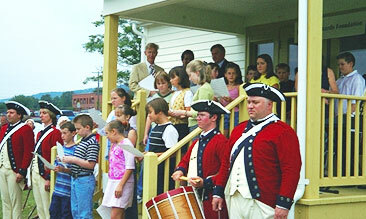 The visitors were charmed by a rendition of The Ballad of the Battle of Great Cacapehon sung by students from Capon Bridge School under the direction of music teacher, Mary O'Malley. The ballad tells the story of the death of Capt. John Fenton Mercer and sixteen men during an ambush not far from Fort Edwards. The other music group was the reenactment group, the Andrew Lewis Volunteer Fife and Drum Corps. Four members of this unit made the effort to arrive early before their scheduled afternoon concert in order to supply period music for the dedication. Everyone who attended the event was delighted with the way their presentation of eighteenth century military music added to the dignity of the day's event. Later in the day the crowd in Romney was delighted by their concert. They were also a great hit when they marched in the evening parade. We hope that the Corps members enjoyed the events as much as we enjoyed their contribution. We note that they have the distinction to be the first reenactment unit to participate in a Visitor Center event. 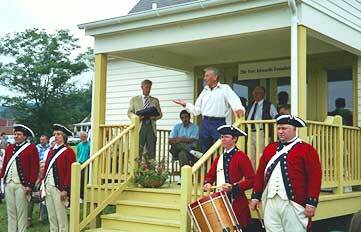 After the ribbon was cut by Delegate Jerry Mezzatesta and Foundation President, Charles Hall, the crowd entered the building to see a display about George Washington and the French and Indian War. Col. Washington commanded all the frontier forts in old Hampshire County from 1755 to 1758 when the threat of French incursion was ended by the capture of Ft. Duquesne. At that time Col. Washington resigned as Commander and returned to Mount Vernon to prepare for his upcoming marriage to Martha Custis. Do you remember a year ago - September 15, 1999 ? 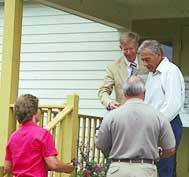 A crowd of hopeful members gather for the groundbreaking. 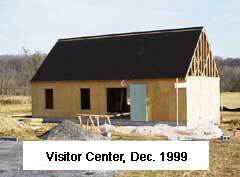 It has been a long time coming, but finally we have our Visitor Center. 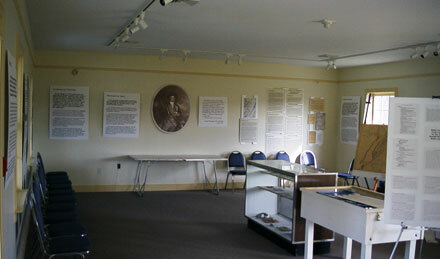 View inside the Visitor Center set up for a monthly Directors' meeting. Col. Washington is always in our minds and hearts. Thanks to Michael Hasty for taking these pictures for us. 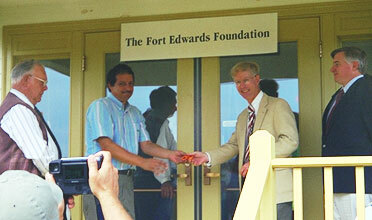 © 2000 The Fort Edwards Foundation. All rights reserved.